Well the second Im done posting thing I PRAY I get to actually stamp! Well I think its time for some MYTIME MAIL? How about you? I have so loved and appreciated all your support, thoughts, and well wishes, its time to give you a chance at a big THANK YOU gift! Who NEEDS to win Its a Jungle Out There? You do?! Well here is your chance! MYTIME MAIL WILL INCLUDE: Its a Jungle Out There-This set retails at $15.95. Plus I will include the recent issue of Paper Crafts Magazine-November 2007 value $4.99, and the recent issue of Crafts n’Things October 2007 also $4.99. I am featured in both, and have 2 projects inCrafts n’Things using the MFT set Fright Night! All you have to do is tell me what your favorite WILD animal is! Id also like to hear what your favorite MFT new release set is. My favorite wild animal is a Giraffe. I dont know what it is but I just LOVE them. My son Noah has had a baby stuffed giraffe named “Raffey” since birth! He still sleeps with it every night. I love their gracefulness despite their awkward long neck. They also have the softness eyes. Im weird I know. My favorite new release set was Meet me at the cafe. I will have the computer randomly pick a winner on Oct 6th-for World Card Making day! cardstock-PT White, pumpkin, river rock, soft sky, apricot by SU! 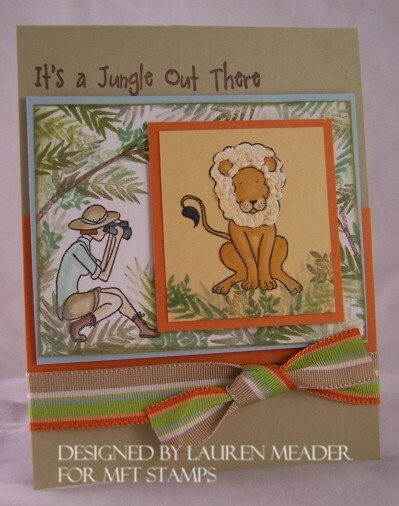 On this card I used this (its a jungle out there) set, and some liquid applique added texture to the lions mane. I was pretty happy with my jungle “scene” as this is not a typical style for me. These stamps made this really easy to accomplish. I love how Kim made the womans face hidden by using her Safari hat! Thats genius!! Thanks for reading! I cant wait to hear what you have to say. Come back tomorrow cause its out Bloggers Challenge! I will post last weeks, and this weeks since I missed one! Then Saturday is the Saturday Sketch and World Card making Day! Plus the announcement of the winner for this Mytime Mail!